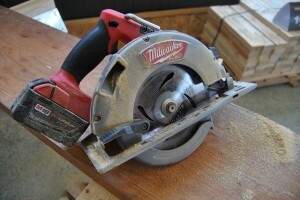 Portable circular saws are important tools in many carpentry projects. The portable circular saw is the backbone of many carpentry tasks. The versatility of modern portable circular saws means they can be used for anything from finish carpentry to landscape construction. This post will review what features to look for in a good portable circular saw. Then I will ranked the top 3 portable circular saws on the market using my own experience, peer feedback, and market feedback. If you want to saw through more than just pine lumber you will need to make sure you get a circular saw with power in the top range of the market. Power in a circular saw is measured in the number of revolutions per minute, or RPM. You should only look at saws with an RPM north of 3,000. Portable circular saws are expensive, and you want your investment to last long enough that the price was worth the value you got from it. Durability is best measured by actual user feedback. For the online shopper that is usual through customer comments and social media. Don’t be afraid to ask your peers on social media for their feedback on durability for any large purchase. However, a portable circular saw is probably a rare enough purchase that social media won’t work directly for you. I suggest cautiously reviewing user feedback from e-commerce sites. Positive feedback is good to see, but only seek for facts in the feedback. Don’t let other’s conjecture and opinion cloud your own review. You need your portable circular saw to work as long as possible. The saw is often needed for every phase of a carpentry project and it is important the one you use provide a battery life that is tops in the market. The best portable circular saw batteries will last for about 35 minutes of heavy use. If you need a portable circular saw for longer periods than 35 minutes you may want invest in two or more batteries so you can charge and work at the same time. The Makita 18V is the tool market’s best mixture of dependability, price, and strength. With 3,700 RPM the Makita 18V is at the top of its class in power. The user feedback on the battery suggests it last about 40 minutes during heavy use and half a day on light projects. The Makita 18V is favored by professionals and DIY carpenters because of its light 7.6 lbs of weight. The light weight allows the user to work longer without fatigue during more difficult projects. If you need an industry leading portable circular saw at a reasonable price I suggest you first review the Makita 18V. The 20V DEWALT has ample power with 3,700 RPM. The DEWALT brand has a good reputation for durability and the comments for this saw backed up that brand history. The battery for the 20V DEWALT is reported to last at least 45 minutes of heavy use. The capacity and ratings for the 20V DEWALT battery are very high. Weight is biggest drawback for the 20V DEWALT. Sixteen pounds is an average weight for a portable circular saw. If it was a bit lighter, the 20V DEWALT would be ranked #1. Price is the only thing keeping the Bosch 36V from my top spot. The Bosch 36V has the features to justify the cost, but I consider value heavily in my rankings and the price of the Bosch 36V is simply too high for the typical DIY consumer. Professionals should buy the Bosch 36V. It is a great tool and you should spend the money for something you use everyday. The Bosch 36V features a class leading 4,000 RPM engine which gives it top power for any carpentry project. Durability marks are high from users and the battery is reported to last for at least an hour of heavy use. If you use a circular saw at least once a week on average you should consider the Bosch 36V portable circular saw. Posted by Scotty Burrell. This entry was posted in Saws. Bookmark the permalink. « What is the Best Claw Hammer on the Market?